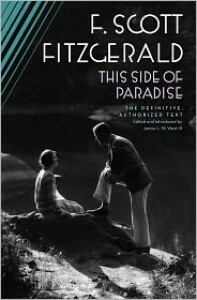 I love Fitzgerald's short stories and The Great Gatsby, but I can't get excited about this book at all. I just finished The Beautiful and the Damned - which was not an exciting read - and this book seems to be along the same lines, except that Amory Blaine is younger than Anthony Patch. Reading this at a younger age - maybe at one more similar to that of Amory's - would probably throw a different light on the story of Amory (who is trying to find his way in the world) and would probably make it more relevant. However, having read The Catcher in the Rye, Die neuen Leiden des jungen W., and other coming of age novels, This Side of Paradise just doesn't do anything for me.